We have Vertically backward integrated facilities that takes care of the entire supply chain of hardware and accessories within a radius of 10 km at our various state of the art plants in Chennai. This provides immense value in the form of reduced lead and consistent Quality. Aluminium Extrusion Plant – This plant manufactures Aluminium Extrusions of various cross sections, which reduces external dependence and hence enhances quality and reduces manufacturing lead time. Aluminium Fabrication Plant – With the help of customized CNC bending machines, Welding machines this unit can produce grading rings, corona rings, dead end clamps and other aluminium fabrications required for Various assemblies. Helical Rod Fabrication Unit – This unit caters to the exclusive manufacture of superior quality Armour rods , Retaining rods, OPGW fittings customized as per client requirement, through different types of machinery. Forging Unit – Commissioned in 1976, the plant today produces 2500 tons of Forging Annually. 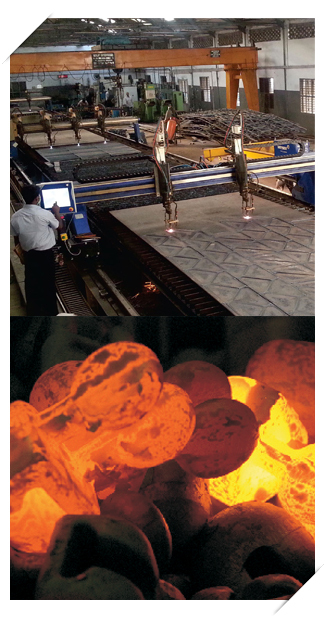 All forging undergoes various operations like (Heat treatment, Short blasting and MPI Testing). Rubber Processing – Mixing & Moulding Shop – This unit manufactures damping elements, liners, cushioned grips and line spacers, initially developed with technical guidance from Du Pont. Our in-house expertise in neoprene compounds helps us in ensuring high quality of the final product. Aluminium Die Casting Shop – The gravity die casting, Pressure die casting facility produces superior quality, durable aluminium alloy castings required for all Transmission line, Distribution lines and OPGW fittings. Steel Fabrication Unit – This unit consist of CNC Plasma cutting machines, CNC drilling machines for the manufacture of all steel Fabrications like Yoke plates, External links etc. required in our assemblies. Galvanizing Plant – An in-house galvanizing plant with Annual capacity of 7000 tons ensures that all our steel products are protected against corrosion during performance life cycle. Tool Room – TAG CORPORATION lays critical emphasis on maintaining its state of the art tool room, consisting of machines, jigs and fixtures required for the manufacture of dies in all its manufacturing process.